Something That We Don't Understand! Music is sound and silence. It is the art of the muses. Music is a part of all human experience. There isn't a culture without it. Music "speaks" to our emotions. Despite its place in our daily lives, we still do not understand why we like music. Research seems to indicate that a majority of people engage is visual/spatial thinking; That is, thinking through visual processing using the part of the brain that is emotional and creative to organize information in an intuitive and simultaneous way. Musical thinking is another form of, emotional, non-verbal thought. We respond spontaneously to music, and then the mind moves on. Only when we hear the same piece again, do we remember it, recognize it. We understand something not only through reason alone, but also through emotions and images that we associate it with. We assign meaning to things, simultaneously through memory, reason, thought and emotion. Similarly, even when we communicate through words, our image, the emotions we attach and our intonation says a lot more than the words we speak - or sing. 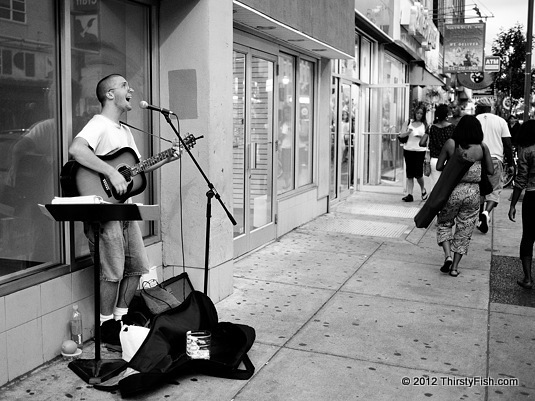 The performer in the photo had a great voice, yet, no one stopped and listened. How does one establish an emotional connection?